Standing on the shores of Loch Duich, close to the point where it meets two more sea lochs (Long and Alsh) on the remote northwest coast of Scotland, Eilean Donan is a small island that is completely dominated by a castle, which must be the most filmed and photographed Scottish castle after Edinburgh. Although first inhabited in the sixth century, the first fortified castle was built in the mid 13th century. 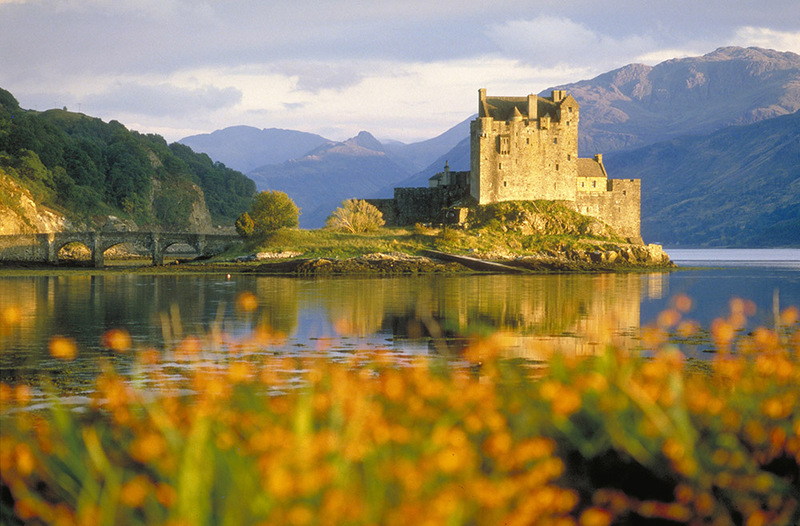 Since then, at least four different versions of Eilean Donan Castle have been built and re-built. It was partially destroyed in a Jacobite uprising in 1719 and lay in ruins for the best part of 200 years until Lieutenant Colonel John MacRae-Gilstrap bought the island in 1911 and set about restoring the castle to its former glory. The castle was re-opened in 1932. Today, you can explore most parts of the castle, including its great hall, filled with clan memoria; the billeting room, containing articles from the clan regiment’s history; the kitchens, which have been restored to show 1932-era banquet preparations; and the upstairs bedrooms, with more personal mementos such as photographs and maps. Eilean Donan castle is connected to the mainland by a stone footbridge and lies about half a mile from Dornie, a pretty village that lies along the A87 route through the Highlands to Kyle of Lochalsh, where you can cross the bridge to the Isle of Skye.